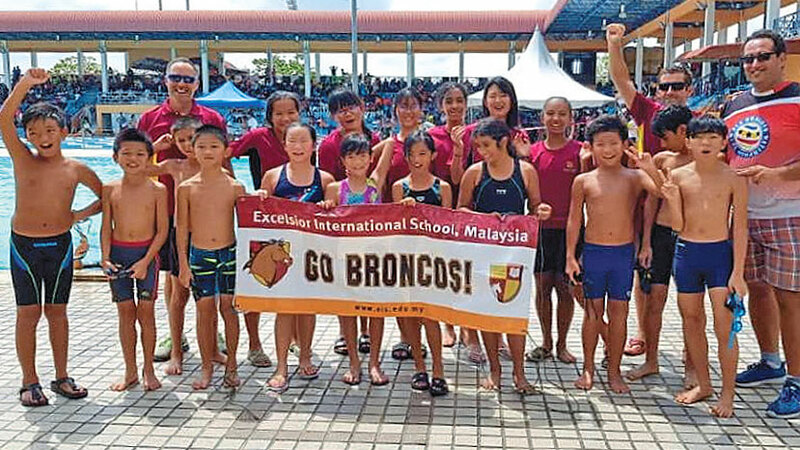 Excelsior International School competed in the 2019 MSSJ Swimming competition which was held over four days (18th – 21st February) at Bandar Penawar Desaru Johor. With almost 250 schools in attendance and hundreds of swimmers taking part, competition was fierce. EIS had one of the largest squads in attendance, which is testament to the school swim program on offer at EIS and the expert tutelage of the Sea Dragons Aquatic Academy (SDAA) who provide extra lessons and support our swim programme. The EIS students’ hard work and dedication to becoming the best swimmers they can be was on show with many of them beating their personal best times. Three swimmers deserve a special mention as they finished in the top 10 of their category: Nicholas Yap – boys under 12 years old, Ariel See – girls 13 to 15 years old, and Belle See – girls 13 to 15 years old. A big thanks goes to the EIS PE team, the students for their hard work competing in the pool, the parents for their support, and the SDAA.With the continued support of the Sea Dragons, the future looks very bright for our talented Broncos Swim Squad.